Medieval Marias with it’s narrow cobblestone alleyways is steeped in history dating back to the 12th century, it was an area largely occupied by nobility. Today, it is very much the Jewish Quarter of Paris and this is very evident on every street corner with the many groceries, deli’s, restaurants and book shops. It is also home to the Memorial de la Shoah – the Holocaust Museum which I stumbled upon during my visit to Paris last October, understandably, it was very moving and emotional and something you must put on your list of things to do. I love the Marais, it’s quirky bohemian vibe is so addictive, it’s an area covering the 3rd and 4th arrondissments of Paris, there’s so much to see and do, little nooks and crannies to discover at a leisurely pace, stopping off for refreshments along the way…. this is my idea of a perfect day spent in Paris. The hotel was bought by the current owner in the late 1980’s who set about refurbishing the house extensively and restoring it to its 18th century radiance and charm. Of the old building, only the foundations and beams remain today and that’s testament to their good quality. To appreciate the beauty of the hotel you must first understand who Pierre Augustin Caron de Beaumarchais was, he was a celebrated author of novels such as The Barber of Seville and the Marriage of Figaro. He was also a watch maker, music teacher, diplomat, ship owner, arms trader, inventor of copyright for authors and royalist spy – a man of many talents it seems. His mansion, 47 Rue Vieille du Temple was the headquarters of the trading house that supplied George Washington and the American Revolution with ships and gunpowder until US Independence in 1782, an interesting character. There is so much history behind the hotel that was once a mansion now named after this French polymath. Having booked Hotel Caron de Beaumarchais for our brief visit to Paris last August, I set about researching the area and what we could do in our short 36 hours, I was so excited to see this hotel for myself and spend some time in the Marais. Upon entering the hotel, you honestly feel you are back in the 18th century, the small lobby is charming, cute and full of artwork and antiques evoking the 18th century period. A large piano sits at one end of the lobby, a table with a scattering of playing cards at another and taking centre stage, a stunning harp, one can imagine a noble lady playing a tune on this elegant instrument…. oh, and how could I fail to mention the magnificent and sparkling diamond like chandelier above, it’s a sight to behold. Chandeliers are a prominent and striking feature of this hotel and adorn the ceilings of every room. I’m struck at how beautiful and intimate this hotel is, it’s like a quaint cottage from a bygone age, going by what I saw already, I knew we were going to be in for a treat. The reception staff on duty was a lovely man originally from England but had travelled and worked all around the world. I honestly thought he was French, I couldn’t tell from the way he spoke, so perfectly and fluently just like a native! I was in awe as I would love to learn how to speak French, I was really impressed but he added that he had always loved languages as a small boy, I’m still persevering in my quest to learn this romantic and sensual language. By the side of the bed, really useful USB sockets to charge our mobiles, this was so useful my husband muttered as I explored the bathroom supplied with my favourite Annick Goutal toiletries. I love Annick Goutal, a quintessentially Parisian perfume house with several shops in Paris and branches in London. Also in the room is complementary wifi, a flat screen TV, air conditioning, in room safe and telephone, even an ironing board, everything you need to make your stay truly comfortable and memorable. Continental breakfast is 13 euros and can be taken downstairs in the breakfast room or in the comfort of your room, perhaps on the terrace if weather permits and it was a scorching weekend when we arrived in Paris however, my husband very much being the outdoor type had decided the weather was too nice and wanted to enjoy breakfast and a cigarette at a cafe while watching the world go by, who am I to argue with that. We had a full on 36 hours but as much as we packed in in such a short time, it was also very leisurely, we felt we had a relaxing time and the weather was gorgeous, in fact, I felt it was too hot. I was literally sweltering, my make-up melting off me as were walking around Paris trying to look very elegant but failing dismally. Returning in the evening, we were welcomed with much needed air conditioning, it was lovely laying our tired bodies on the most comfortable bed and drifting off to the most welcome sleep. I’m truly grateful to the hotel for their hospitality and making our stay so memorable, the Caron de Beaumarchais lived up to the rave reviews and surpassed my expectations. It’s a hotel that I will certainly return to again and the best bit, it’s so affordable with doubles starting at around 150 euros per night. For Helen’s full article head to her blog London Meets Paris. 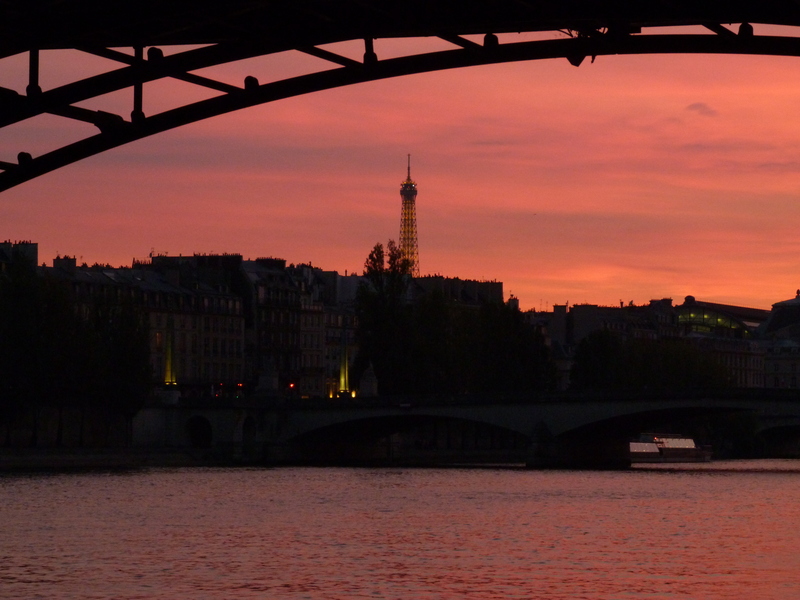 Thank you Helen for sharing your lovely writing here on Prête-Moi Paris! ← Jardin de Luxembourg : Kids Paradise! Looks like a lovely small hotel! Great to know!